Whether you’ve already mastered yoga and you’re looking for an exciting new challenge, or you’re just looking for a fun new way to meditate, aerial yoga may be for you. Aerial yoga uses traditional yoga poses and adds a swing, hammock, or trapeze component, so that you’re doing yoga while suspended in the air. It can be a challenge, but it’s not taking the internet by storm for no reason, there are several benefits to aerial yoga, and more specifically, yoga trapezes. 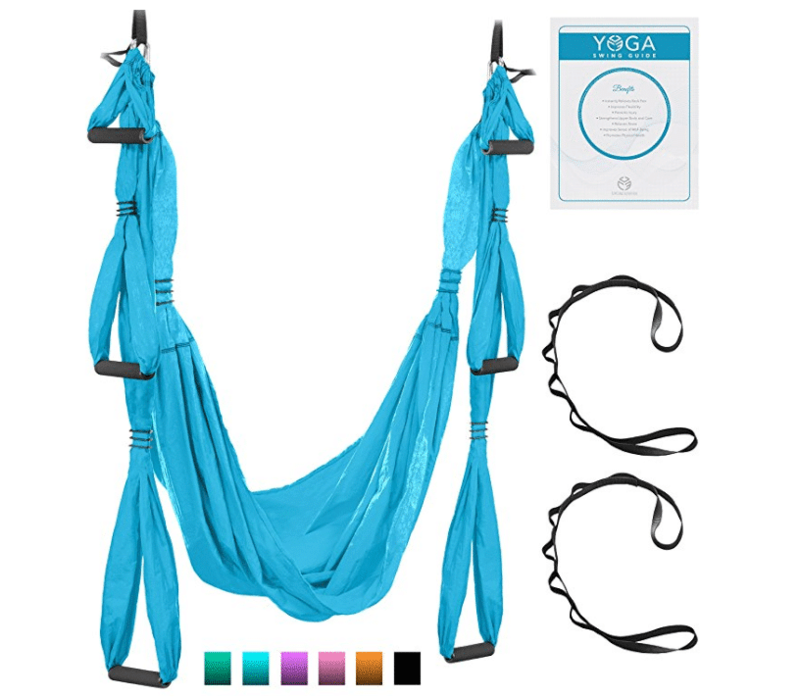 We’ve rounded up a few of the most noticeable benefits of yoga trapezes, along with some things you should know and consider before buying one, and some of the best yoga trapezes on the market. Why Do You Need a Yoga Trapeze? One benefit of using a yoga trapeze is that it can be great for spine health. Using a yoga trapeze for aerial yoga allows for spinal decompression, which can help take pressure off of your spine and ease back and neck pain. Whether you are just hanging and letting your spine lengthen or you’re doing yoga poses, yoga trapezes can serve as a form of inversion therapy, a proven method of decompressing the spine and improving circulation. A major benefit of decompression, and therefore yoga trapezes, is the improved blood circulation it can cause. By allowing your spine to decompress and relieve the weight that is pressing on it you are allowing blood to flow to all the nerves and tissues in your back and neck that might otherwise be pinched or restricted. Aerial yoga doesn’t just improve blood and nutrient circulation in your spine, but for all the joints and muscles in your body. Improved circulation allows for waste and toxins to be removed from your body more efficiently and more oxygen to be delivered to your muscles, meaning less fatigue from everyday activities. Aerial yoga can be a great way to strengthen and tone your body without getting those big, bulging muscle builder muscles. Since nothing is really holding all of your weight for you, yoga trapezes engage your entire body and all of your muscle groups, making it a full body workout. It is especially good for strengthening your core, which a lot of people struggle with. Yoga trapezes allow your body to get into deeper stretches just by the sheer power of gravity. As gravity pulls down on you, you sink deeper and deeper into your pose, improving flexibility and even further improving circulation. Using a yoga trapeze regularly can improve your flexibility, stamina, and agility during everyday activities and other forms of exercise, which is why it’s a popular choice for athletes. It’s a perfect cross-training activity for athletes, not only because it can improve agility and flexibility, but because it can also improve your balance. Aerial yoga can be a great way to just relax and recharge mentally. Many people find it meditative and even spend time just hanging in the trapeze and meditating. Using a yoga trapeze for aerial yoga can help clear your mind, promote relaxation, and improve focus and creativity, meaning the benefits of purchasing a yoga trapeze reach beyond just physical health. Aside from all the health and mental benefits of yoga trapezes they’re just plain fun. Being suspended above the ground in a yoga trapeze is the closest thing you can get to actually flying and it makes doing yoga poses on a mat way easier. It’s one of the most fun ways to exercise because it hardly even feels like exercise and it can actually improve your mood. There’s promising evidence that aerial yoga and yoga trapezes can boost the amount of serotonin your brain releases, aka the happy chemical, raising your spirits and putting you in the right mood to face the challenges of your day head on. Before you choose a yoga trapeze you should make sure it’s made from high quality, durable, and comfortable materials. You want something that is soft, since you’ll be making lots of contact with it, but also something strong enough to support you and last for years to come. A trapeze made from sturdy parachute material is your best bet, but sometimes the parachute material is so sturdy it has little to no give, which isn’t ideal for aerial yoga. If you’re shopping online, be sure to read plenty of reviews to gauge how comfortable, sturdy, and forgiving the material is. You should also keep the weight capacity of the yoga trapeze in mind while shopping. Most trapezes can hold at least 250 pounds, but you should double check and make sure whatever trapeze you buy can hold your weight, or ideally more than your current weight. If you choose a trapeze that cannot adequately support you, you may end up doing damage to the area where it was installed or end up injuring yourself. Not everyone has the room for a full blown home gym, or even a permanent yoga trapeze, which is why portability is important when choosing a yoga trapeze. If you need to save space look for a trapeze that can be put up and taken down without much effort. Some portability factors to consider include if the trapeze comes with a carrying case, how it is installed, overall durability, and weight. Finding a trapeze that is portable means you can take it with you wherever you go and you aren’t just stuck in one place. The yoga trapeze you ultimately settle on should have a warranty policy that you’re comfortable with. Many trapezes offer at least 30 days of warranty, which is great for getting the feel of the trapeze and deciding if it’s for you, but the longer a warranty is, the better. A longer warranty means more protection behind your purchase and less of a chance you end up out of a yoga trapeze and your money. A good warranty will cover parts, including the parachute material, and will offer a replacement if it ends up breaking. However, if you find a trapeze you really like but it doesn’t have as long of a warranty as an inferior brand, don’t let that hold you back from getting it, warranty should be a considered factor, not a deciding factor. Before buying a yoga trapeze you should consider whether or not one for home use is even right for you. Out of all the different types of yoga swings, trapezes are the best for beginners, which is why many people choose to buy a yoga trapeze to start their aerial yoga adventure at home. As long as you do plenty of research and follow the instruction manual for installation, you should be fine. Some people prefer to start in a beginner’s class to get a feel for the trapeze and learn the basics. However, these classes are not offered in all locations, so it’s not a viable option for everyone. Many people choose to do a combination of classes and exercising at home, which is a smart choice. Getting to know the equipment and how to use it before buying one for home use can make it easier to use once you buy it and make the learning curve a little easier to handle. Not to mention, taking a class before jumping in on your own will greatly reduce the chance of injury to yourself or personal property. 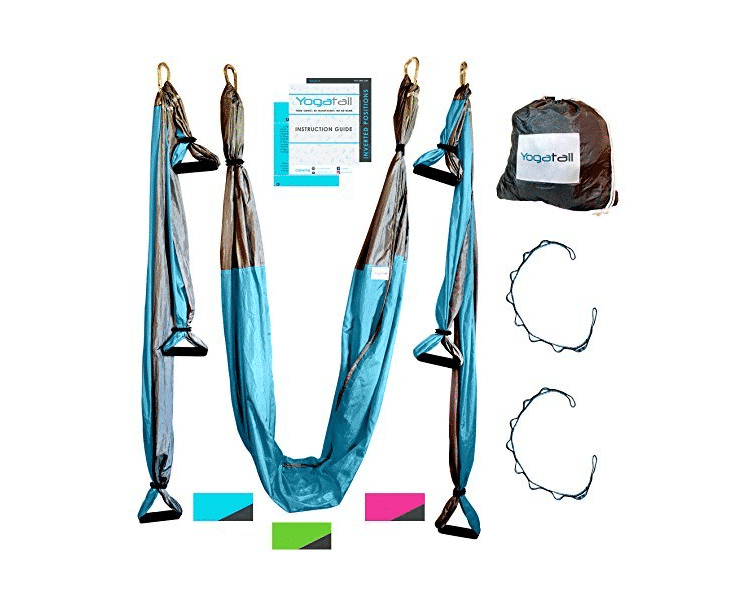 Professional Quality: This yoga trapeze from YOGABODY is extremely durable and made from only high quality materials. The same trapeze is used by pros all over the country and is made from sturdy, parachute material, comfortable rubber grips, and rock climber grade carabiners for installation. Having a trapeze constructed from high quality materials is one of the most important things when shopping for a trapeze, since it is necessary to ensure safety, making this one very desirable. Risk Free:Purchasing this trapeze is virtually totally risk free since it comes with a great warranty. All parts of this trapeze are covered by a 10-year warranty from YOGABODY, so you don’t have to worry about a thing. If any part, or all parts, of the trapeze breaks within 10 years of purchasing it, the company will replace it at no cost to you. This allows you to use it with total peace of mind and without fear of breaking it and wasting your money. Easy Installation: Perhaps the best part of this yoga trapeze is that it’s super easy to install in a variety of different areas. Since written instructions can sometimes be difficult to follow and more confusing than helpful, the company has easy to follow videos on their website and youtube that show you how to install the trapeze in just a few minutes. It can be installed almost anywhere in your house, including your bedroom, living room, a sturdy exposed beam, or even the tree in your backyard. 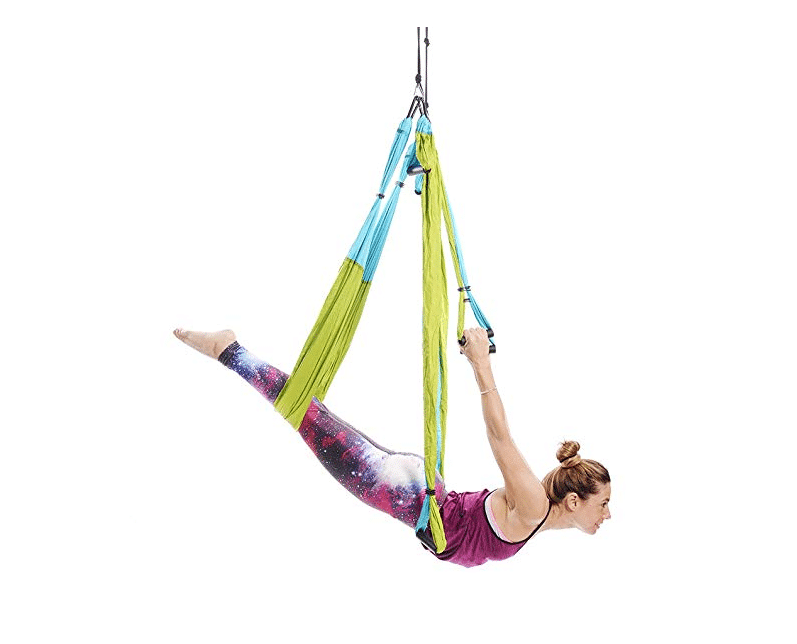 Maximum Comfort: Comfort is key when it comes to yoga trapezes since you’ll be spending lots of time in it, which is why the maximum comfort that this trapeze offers is so advantageous. The parachute fabric is soft to the touch and the seat is designed to be more spacious to maximize comfort and accommodate users of all sizes. Additionally, the six handles are padded with extra thick foam, so it is easier on your hands and feet. Extra Accessories Included:Unlike some trapezes that only include the bare minimum, this swing comes with two sturdy, adjustable daisy chains, a carrying bag, and a guide book for beginners. The chains make it easy to adjust it to any height you need, making it even further suitable for users of all sizes. The carrying case means this swing can easily be taken with you on the go and greatly adds to its portability. Lastly, the guide book walks you through various yoga positions step-by-step and is a great tool for beginners to learn the basics. 550 Pound Load Capacity:The parachute material used in this swing is not only comfortable but incredibly durable and can hold up to 550 pounds, making it suitable for almost everyone. The seat and swing would be nothing without the super strong carabiners that hold it up, though. From top to bottom this trapeze was designed for strength, using only the best materials available and helping to prevent injuries. Versatile:This yoga trapeze, also sometimes called a swing, from EverKing puts an emphasis on versatility and customizability. This trapeze is suitable for both men and women up to 400 pounds and can be installed indoors or outdoors. It’s also versatile in the fact that it can be installed many different ways, whether you want to buy a door frame mount or suspension hooks for your ceiling. The height can also be adjusted, so users of all size can find just the right settings for them. Lastly, you can also choose from one of five colors for your trapeze, although this doesn’t affect performance at all. Easy Setup:No matter how you choose to install this swing, setting it up is a breeze and can be done in just a few minutes. However, it should be noted if you choose to hang it from an exposed beam make sure it is at least 4 inches thick, typical 2 x 4s are not strong enough to hold as much weight as this swing can. Storage Bag Included: The storage bag that comes with this trapeze makes it even easier to take it down and set it up as you please. Instead of having to throw it in the corner or leave it hanging at all times, you can simply put it in the storage bag and take it back out when you’re ready to use it again. And best of all, the storage bag doesn’t add a whole lot to the price tag, making it one of the most affordable options on our list. Maximum Durability:This yoga trapeze may appear simple, but it was built to last. It’s made from high quality material and crafted with reinforced stitches to ensure it can hold all of the stress you put on it. This is a relief because the last thing you want when you’re using a yoga trapeze is to feel like you’re about to fall or the straps are about to snap. The material is the same kind pros in studios use and you get that same high quality without having to actually go to a studio, so it’s a win win. 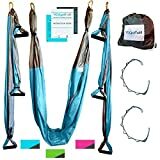 Plenty of Accessories: Although this swing doesn’t come with any mounting accessories, it does come with two height adjustable straps, a carrying case for the straps, a carrying case for the trapeze, and a very informative ebook to help you get started. The book has tips and detailed instructions for various yoga positions and can be useful for users of all skill levels. Thick Foam Handles: The thick foam handles on this swing make it easier and more comfortable to use. The base of the handles is made from a durable plastic that is then covered in thick foam that are designed to fit all users. This makes it easier to use the swing for extended periods of time without having the handles dig into your hands and feet or become uncomfortable. Reinforced Stitching: The parachute material that makes up this trapeze is triple stitched and designed to be super sturdy. 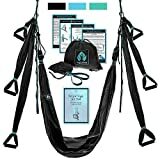 However, the strength of this trapeze goes beyond just the parachute material, including the pro climber grade carabiners that are included that can support your weight without a problem. And all of this is done without compromising any of the comfort that you’d expect. Two Storage Bags: This swing comes with not one but two storage bags, one for the swing and one for the additional daisy chains that are included. This is nice because it allows you to store each separately in case one is dirty or you don’t need one at the moment. It also makes it easy to take everything with you when travelling and makes storing them at home easier. The storage bags are made from the same high quality parachute material as the swing, so you can expect them to last just as long. Comprehensive Warranty: This swing comes with one of the best warranties on this list, a full five-year warranty on all parts. If you aren’t totally satisfied with the swing or any part of it, they will replace the part or the entire thing, or give you a full refund. Their customer service is very helpful and make any warranty claims you may have easy to file and follow up with. What is a yoga trapeze? A yoga trapeze is just one type of many different types of yoga swings. The swing-like contraption allows you to hang from it in various positions and poses and is great for your body, mind, and soul. Yoga trapezes are great for beginners and offer a full body, zero impact cardio workout that you just can’t beat. They allow you to achieve deeper stretches, such as back bends, and provide a way for you to workout at home without the intimidation that sometimes come with large yoga classes. Yoga trapezes are known to relieve back and neck pain and can sometimes be used in rehabilitation therapy. How are yoga trapezes different than yoga mats? The most obvious difference between yoga trapezes and yoga mats is that trapezes are suspended in the air, so you’re never actually touching the mat. Some people say they are more challenging to use than a yoga mat, but they definitely have their advantages. For one, yoga trapezes take the pressure off of your joints and spine, making it a zero impact workout. Whereas practicing yoga on a mat can be rough on your knees and spine. Also, after using a trapeze and getting the hang of it, the added limberness and balance it gives you may make traditional yoga poses on a mat even easier to use. Yoga trapezes are completely safe when set up and used correctly. However, if you set it up or use it incorrectly you may do some damage to you or your property. Yoga trapezes should not be used by pregnant women or people with serious handicaps that may preclude you from safely using the trapeze. A good way to ensure safety is to take things slow while you are learning to use your trapeze and possibly have someone else in the room with you in case something goes wrong. How do I install a yoga trapeze? The installation process will vary from trapeze to trapeze, with some being easier than others and some being sturdier than others. No matter how the trapeze is installed, they all use some sort of rope or chain to hang the actual trapeze from, but what it hangs from will differ depending on how it is installed. Some trapezes are installed directly in the ceiling, using ceiling hooks, although this takes away from the portability of the trapeze, since installing hooks in whatever ceiling you’re working out under is pretty impractical. However, a more portable installation solution is to use a swing stand. Stands are self-standing, sturdy, and many can be collapsed and moved with the trapeze, but they take up more room in your house. Other trapezes come with simple door mount bars and can be installed in any room of your house. These are quick and easy and do no damage to your door frame or ceiling, like mounting to the ceiling with bolts. However, some people say these are not as sturdy. Choosing an installation method before purchasing a trapeze may make it easier to narrow down your options and make a final decision. However you choose to install your trapeze, and whatever trapeze you choose, you should always follow the instructions that come with the trapeze to a tee, in order to ensure your safety. How much do yoga trapezes cost? 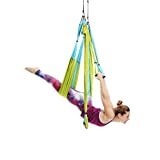 Like with every other piece of workout equipment, yoga trapezes exist on a spectrum, from low-end, more affordable options, to more luxurious, costly high-end options. They typically cost anywhere from $20 to over $100, but usually don’t cost much more than $100, making them, overall, very affordable. There are great options along the entire spectrum, so you shouldn’t feel pressured to purchase a trapeze way out of your budget range. The more expensive trapezes usually just come with added accessories that are nice but aren’t totally necessary, the higher price doesn’t always mean higher quality. If there can only be one winner, it’s got to be the famous YOGABODY Yoga Trapeze. When you buy the YOGABODY swing you’re paying for unmatched quality that pros all over the country trust, and you’re getting it from one of the biggest brands in the aerial yoga industry. The durable yet comfortable design makes it perfect for inversion therapy and the multitude of health benefits it can provide makes it more than worth the cost. However, if you aren’t feeling the YOGABODY yoga swing or you want a more affordable option, any of the other swings on our list make a great choice, too.